What does it promise? Super smooth, hydrated, illuminated skin for days when you really want to shine. Does it deliver? The pearlescent shimmer mica powders literally glisten on your skin to resemble fine diamond particles, while the formula itself sinks in quickly to leave your skin feeling hydrated without any greasy residue. It smells quite strong in the tub, but once applied to your skin, just gives a hint of sweet, white flowers. Plus, there’s a one-off chance to win a real diamond and £5000 cash every week. 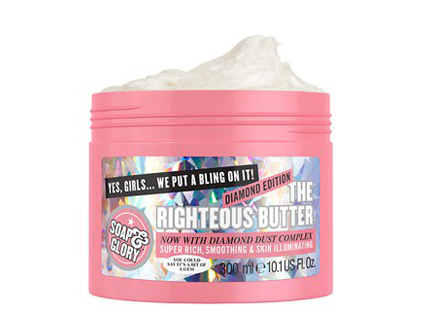 All you have to do is soak off the label on the bottom of the tub to reveal your code and head to righteousbutterbling.com to find out if you’re a winner.